A benign Government forced a period of Medical leave on me. Late Sir C. Y. Chintamaniplaced a copy of'Manasara SilpaSastra' at my disposal. Certain discrepancies in the book made me to investigate. Satisfactory solutions encouraged me to further investigation and research. This book is the result of my investigation lasting over a period of severalyears, through a period of busy professional life as an Engineer. My investigation and research are not complete. It is hoped that others may take up the subject and present a true appreciation of Indian culture. My thanks are due to the Archeological Department, Government of India, and the Municipal Board, Allahabad, for giving me permission to insert some of their Pictures in the book. 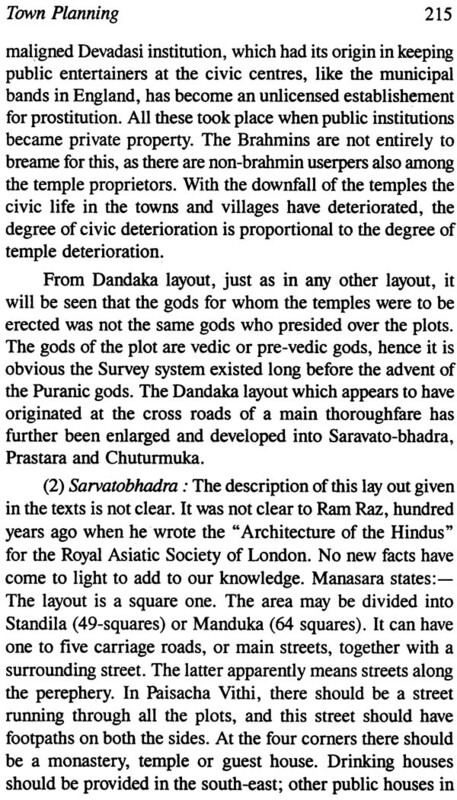 In 'Manasara Vastu and Silpa-Sastra' certain discrepancies in the book made me to investigate. This book is the result of author investigation lasting over a period of several years. 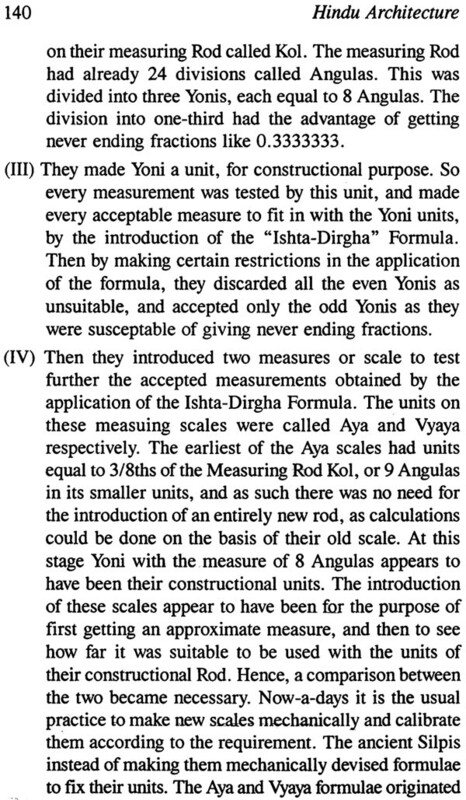 This book deals with fourteen chapters like: First chapter is introductory, Second chapter is Determination of the Cardinal points, Third chapter is Hindu System of Surveying, Fourth chapter is Hindu Measurements, Fifth chapter is Hindu proportions or the Relation between Length and Breadth, Sixth chapter is the Perimeter and the Yoni, Seventh chapter is Tests for Measurements, Eighth chapter is Hindu Fractions and limiting values, Nine chapter is the Sacrificial Altars, Tenth chapter is town Planning, Eleventh chapter is House Planning, Twelfth chapter is Sculpture, Thirteenth chapter is about Silpis, who are they?, Fourteenth chapter is Conclusion. In the last of the book Dictionary of Architectural Terms, Bibliography and Index has been given. In days gone by when there was no difference between Art and Craft, and the artists and craftsmen were the same, the Hindus used the term ;SILPI; to designate the artist, architect and sculptor, whose activities extended to the sciences, such as mathematics and astronomy. 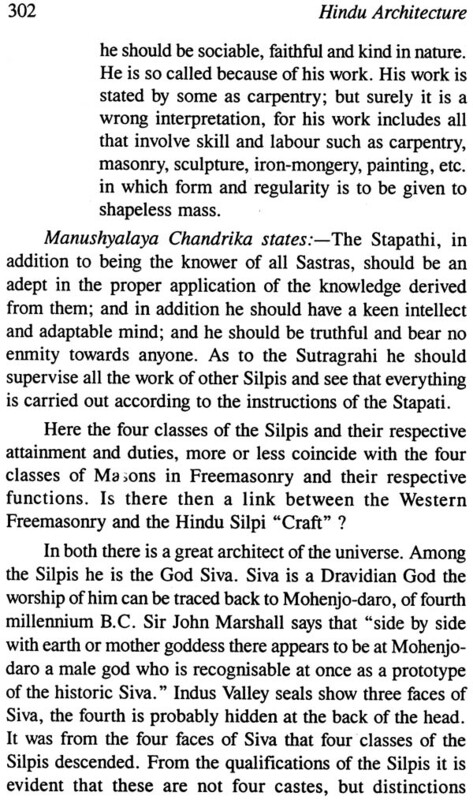 Hence, ;The way of the Silpis; means the Hindu approach to the Art and Science. It is generally admitted now that the Hindus in ancient times had acquired a. high standard of proficiency in Art, Architecture and Mathematics. To judge the exact extent of their attainment has become practically impossible owing to (i) the scarcity of accurate records, (ii) waning traditions, and (iii) introduction of religion and superstition in purely scientific matters. There are, however, a good many books and traditions from which, if the garbage is removed, facts can be collected in a remarkable degree. The chief sources of information are the SilpaSastras, Puranas and Agamas. TheSilpaSastras are treatises on Architecture and Sculpture. 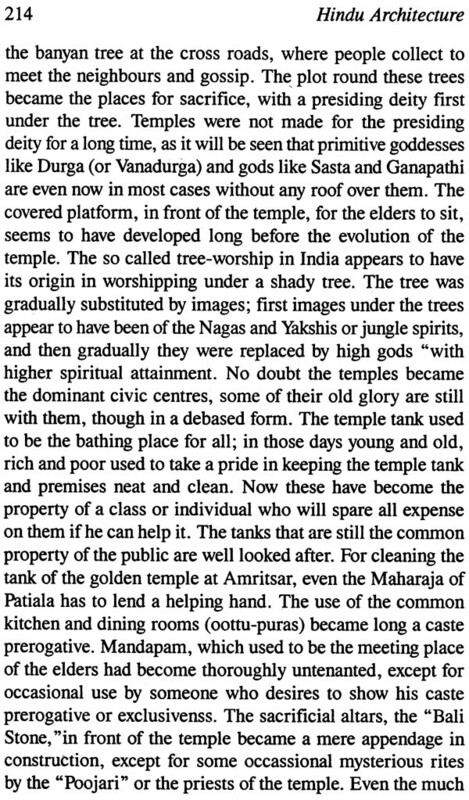 The Puranas and Agamas contain ancient practices, both religious and secular. The SilpaSastras must originally have been written by the Silpis or the Architects; but the books, that are now available, bear more the stamp of transcribers than that of masters well versed in the art. Hence errors of omission and commission and loose or incorrect renderings are common rather than rare. The Puranas deal with many a subject in the purview of one volume. Agni Purana, for instance, one of the best known of them, deals with Law and Order, War and Defence,Astronomy and Astrology, Diplomacy and Monarchy, Herbs and Medicine, Geography and Physiography, Religion and Witchcraft, Penance and Discipline, Fortunetelling and Dreams, Architecture and Sculpture, among the rest. It would have been hardly possible for anyone individual to be proficient in all these. The writers appear to have realised this truth; hence they attributed all the Puranas to divine beings or Gods. The Agamas, like the Puranas, are encyclopaedic works, dealing with heterogeneous subjects. The twentyeight chief Agamas, like the eighteen Puranas, deal incidentally with Architecture and Sculpture. 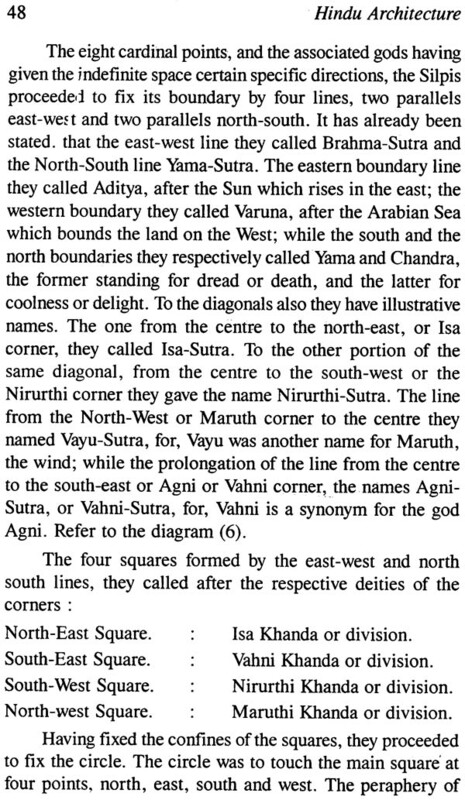 What the Puranas are to North India, the Agamas are to South India. 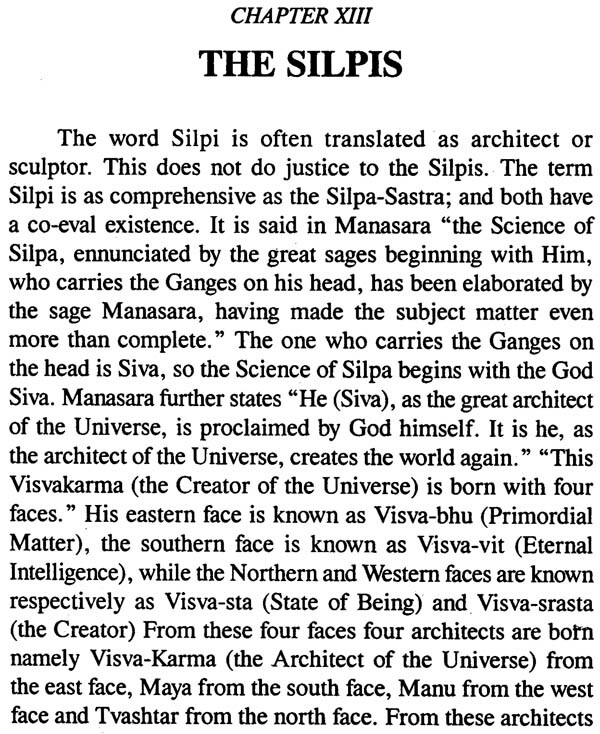 The origin of the SilpaSastra is attributed to Siva, the Great Architect of the Universe.Every knowledge is supposed to have been given out by the gods to particularly chosen individuals of a semidivine character, who in their turn handed it down to posterity through chosen disciples. Consequently the inventor and the author are both lost in oblivion. This practice is not in any way peculiar to the Hindus; every religion tells the same story; and every tradition repeats it. Even the ancient Greeks attributed to Pythagoras all mathematical discoveries, even those that were made after his death.In India priceless discoveries, like the Zero and the placevalue notation, are anonymous; nevertheless they are there, and have helped the world to make gigantic strides in mathematics centuries afterwards. In an age when literacy was limited, knowledge was in the custody of a privileged few, and script and spoken languag underwent constant changes, it is but natural that records should become few and inaccuracies creep in even into those that were kept.When the antiquity of the discoveries and the inauguration of the practices are judged by the lapse of time and by the changes taken place in the country, it is surprising what a great volume of information has come down to us, though often distorted and garbled into religion and superstition. In sifting the truth out from the Puranas andSastras, one is naturally inclined to be influenced by prejudices and preconceived notions which are easy for no one to discard. However, a sympathetic consideration and broad outlook will serve to discern the facts and to present them in their true perspective. The Silpi practices and rules should be considered as dating back from the beginning of Indian Civilization, provided they were not borrowed from other nations. 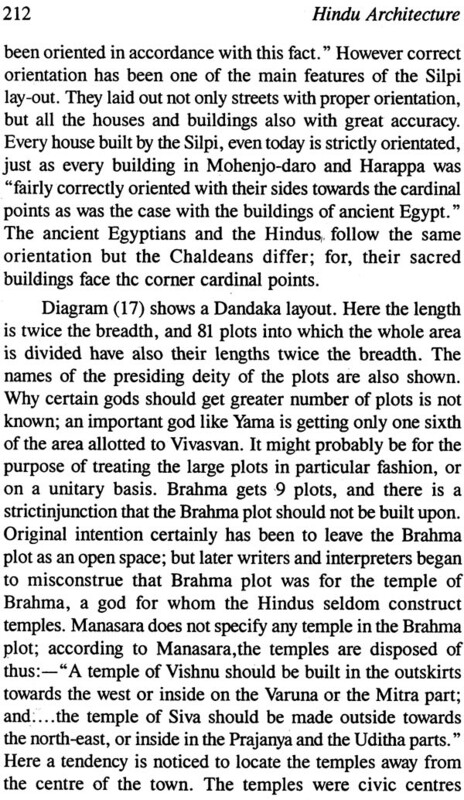 In judging the beginning of Indian Civilization, the Rig Veda used to be the determining factor; but since the discovery of the ruins of Mohenjodaro and Harappa, the beginning of Indian Culture should naturally be pushed back beyond 3,250 B. C. Greek Mathematics had its origin in Asiatic Anatolia about the middle of the sixth century B. C. practically at the same time that Buddhism made its appearance in India. The wellknown civilizations, prior to this, were those of Egypt and Chaldea. The Egyptian civilization dates back to the fiftyninth century B.C., while that of Chaldea, according to some, may be earlier still. Whether these civilizations had any influence on Indian culture, or the ancient Hindus mapped out a line of their own, is a controversy which may become acute in years to come, when more Mohenjodaros, the cities of the dead, are brought to light by the spade of the Archeologists in the plains and tablelands of India. Mathe maticalinvestigation, however, may reveal a close resemblance between the ancient Hindu and the Egyptian practices. The value of , or the relation between the circumference and the diameter of a circle used to exercise the imagination of thinkers in all countries; consistent attempts at squaring the circle were given up in Europe only within the last two centuries. The Egyptian value of ? ?, according to the Rynd Papyrus, a document written in the earlier part of the nineteenth century B. c., is (16/9)2. It is surprising to see that it is the only convenient value of ?? that can be used in circling a square, to construct Vedic Altars. The trapezium, which forms another famous altar of the Hindus, bears a close resemblance to a trapezium given in the Rynd Papyrus. If the facts are such, are these mere coincidences? Or do they show the influence of one culture on another ? Is it likely that the Hindus, most orthodox as they were, borrowed the secret of their religious rites from the Egyptians? Or did the Egyptians, who constructed the Pyramids, get a workable value of ?? from the Hindus or the Dravidians of Mohenjo daro fame? 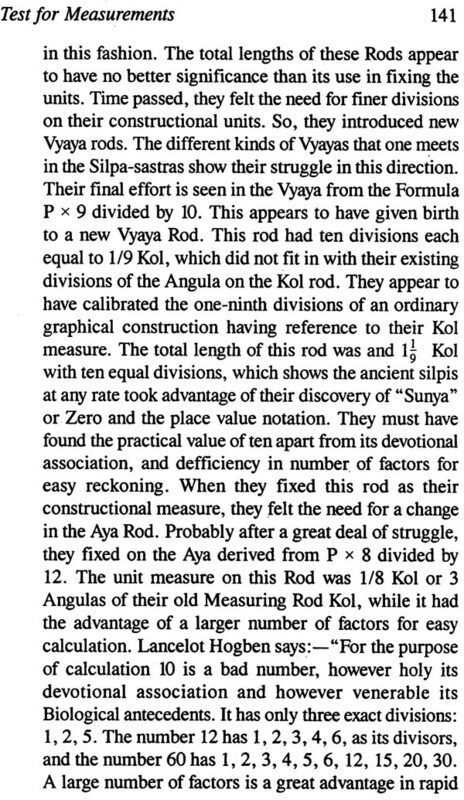 It is stated even by some of the most distinguished scholarsthat Geometry became essential to the Hindus on account of their sacrificial rites. This, it seems to me, is putting the cart before the horse. Most probably the regular construction of the sacrificial altars originated in their desire to keep geometrical truths alive; the aborigines, like the Orans and Mundas, do the sacrifices without much Geometry about their altars. 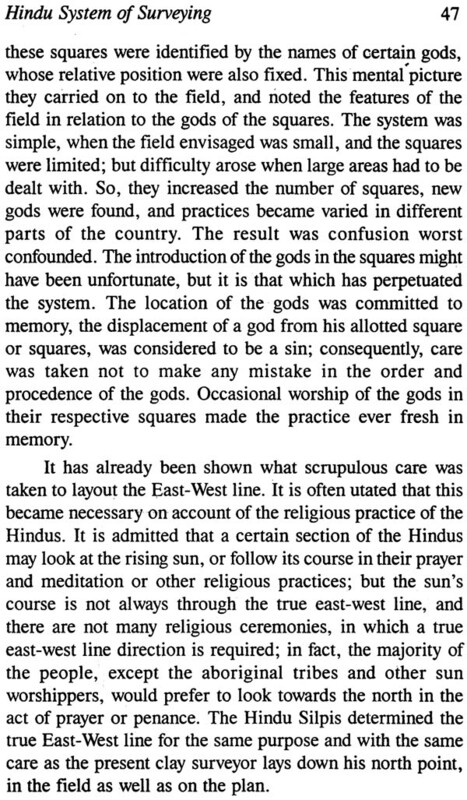 If the Pharaohs have built Pyramids to perpetuate astronomical and mathematical facts, and if the Druids built Stonehenge for a similar purpose, why should the Hindus not have elaborated their altars to perpetuate geometricalprinciples? In ju himself to their su become explicable. The SilpaSastras are many. 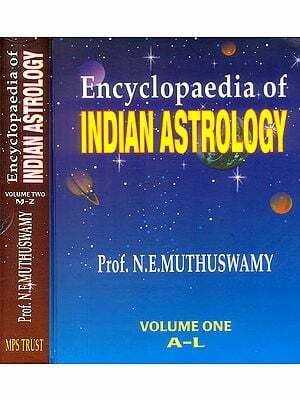 In Manushyalayachandrika, a later treatise on Silpasastra, found on the Malabar Coast, the author, Tirumangalathu NilaKantan Mutsu states that he consulted several standard works on the subject, before he commenced his book. The books he consulted were: MayaMata(2 volumes), Prayogamanjari, Nibandh anas, Bhaskarieyam(2 volumes),Manumata, Guru padhathi, Markandeya(2versions), Parasara Ratnavali, MurariRatnavali, Kasyapamata, Visvakarmamata, Kumara agama, Vastuvidya, andThantrasamuchaya. The exact date of the Manushyalayachandrika is not known; the book, however, is not very ancient, may not be more than three centuries old. Most of the names, associated with these books, are house hold names even now, namely, Maya, Viswakarma,Parasara, Kashyapa and Manu, thoughthey lived centuries before Christ. 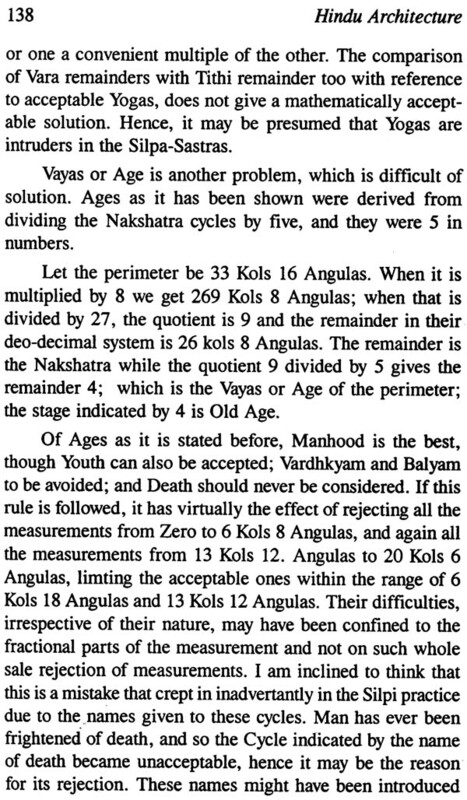 Maya appears to be the most ancient of these; his time cannot be determined, but decidedly he was a Dravidian. 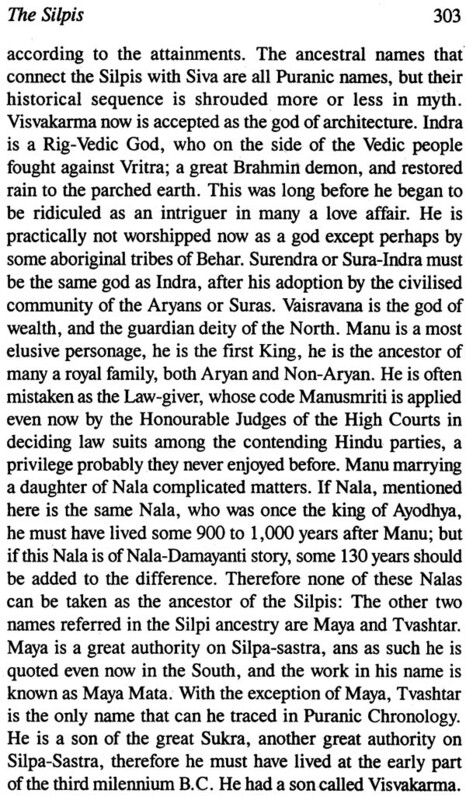 The latest of these appears to be Manu; but this Manu should not be confused with the King Manu, the progenitor of the Ikshvaku kings of Ayodhya. Manu, the author of the ManuMata, is most probably the Lawgiver Manu; and as such, he must have lived about the eighth century B.c. Parasara's time can be determined in relation to the date of the great Mahabharata war. The date of the Mahabharata war, according to Professor Radha Kumud Mukherji, is about 1,400 B.c. ; but JusticePargitter's more conservative computation fixes it at 950 B.C. Parasara lived two generations before the Mahabharata war. Therefore, it can safely be stated thatParasara's time was about 1,000 BrC. The Bhaskara, connected with the Bhaskariem, may be one of the two Bhaskaras. 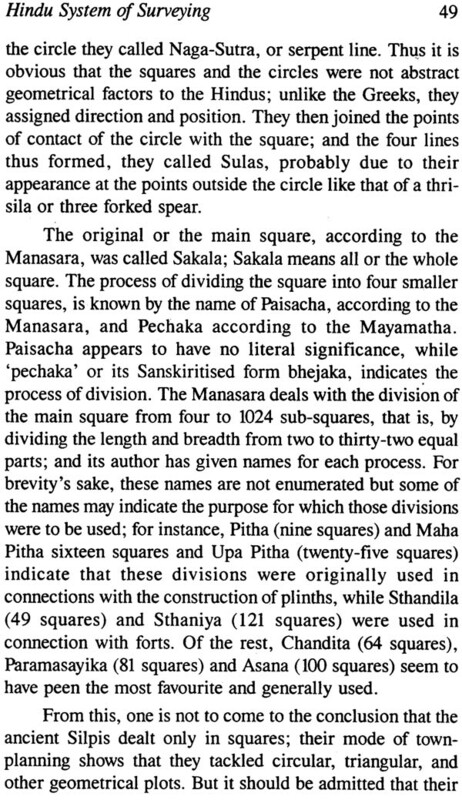 If it is Bhaskara 11, he appears to have lived about 1150 A.D. It should be noticed that Nilakantan Mutsu, the author of theManushyalayachandrika, does not mention the ManasaraSilpaSastra, the monumental translation of which by Dr. P.K. Acharya has given us an entirely new outlook on the much discredited architecture of the Hindus. Probably, Manasara was not known in the south. 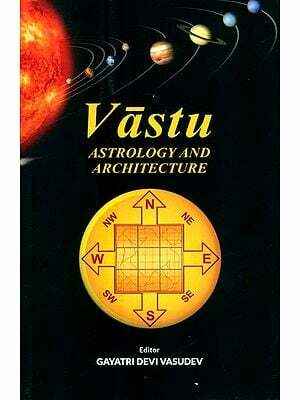 There are three books, associated with the names of Visvakarma, namely,Vastukarma, VastuSastra and Prakasa. He should not be mistaken for the Visvakarma, the great Architect of the Universe. Kasyapamata is attributed to the sage Kasyapa, who is considered a great authority, particularly by the Silpis of South India; and he is reputed to be the progenitor or preceptor of the Tamil Brahmins of the Kasyapa gotra(or clan). Many Bengalees also consider him as their preceptor. 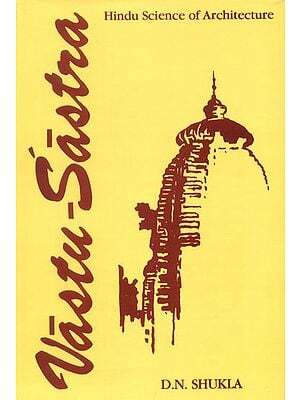 The last two books, mentioned in the list, Vastuvidya and Thantrasamuchaya, are both well known and commonly used by the Silpis on the Malabar Coast. 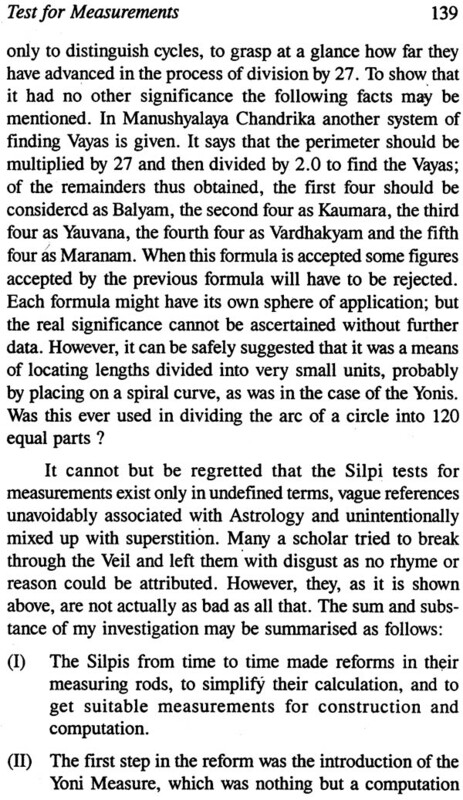 No doubt, some books of Silpasastra, like Mayamata, have their origin in the hoary past, but that is no excuse for giving the entire works such great antiquity as is given by some scholars. If the construction of a Buddhist temple is mentioned in any book, as it is done in Manasara, it is certain that at least that part of the book was written at a date later than that of Buddha. 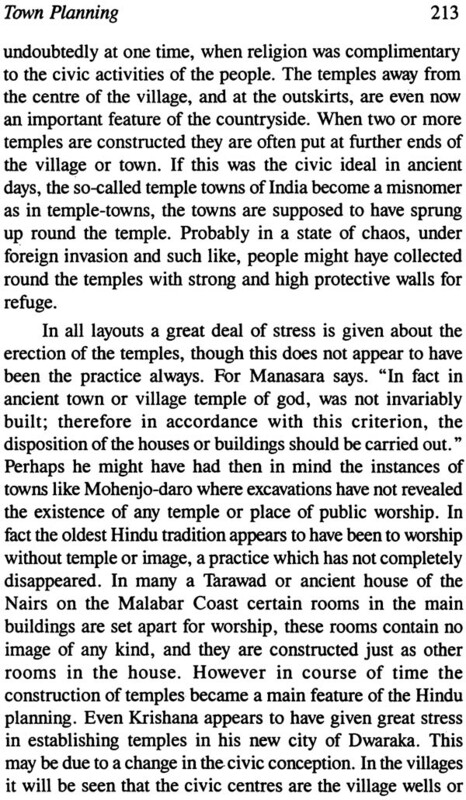 However, from the rituals and ceremonies associated with the layout and construction of buildings, it will be seen that the Silpasastras attained their maturity at a time, when it was the general habit of the people to eat meat and drink wine, which has not been the general custom since the revival of Hinduism, after the Buddhist period. At every stage of construction, the sacrifice of animals and dedication of wine or spirits are ordained by the Sastras. If people were nonmeat eaters and teetotallers at that time, this would not have happened. Indians were greatmeateaters until the time of Asoka. His reign began about 263 B. C., and from his edicts it will be seen that he discouraged meateating. So it can be assumed that the Silpasastras took their formal shape, at any rate, before this period. At present, those who practice the Silpasastra generally are not caste Hindus; especially in the South, they belong to the socalled untouchables. Yet at the time of the rituals and ceremony they don the sacred thread and perform ;Pujas; (sacred rites),indicative of the fact that their ancestors at any rate were ;Dwijas; or men of rank and position. It is this class of Silpis, who nurtured and maintained the Silpa sastras and handed them down to posterity. Unfortunately, the Silpis seem to have done little in the way of writing; even if they did any, we have not the benefit of it. The few books that are available seem to have been written by nonsilpis; their authors certainly were learned men, and we owe them a deep debt of gratitude for preserving the traditions of the past. They have collected whatever information available to them; some of them have put the materials down in the excellent language and form of those days which, unfortunately by custom and convention, had to be verse. Metre and rime made it easier for the scholar to commit the works to memory, but the works lack the lucidity of prose and the direct approach to the subject matter, which can be achieved, effectively only in prose. What was written in verse was capable of different interpretations; and in a language like Sanskrit, which has got an extraordinary number of meanings for words and phrases, each scholar was liable to give his own interpretation. What we find in later works are these interpretations. If the authors were Silpis or technical men, who carried out design and construction themselves, a great deal of doubts and uncertainties would have beenavoided. The major portion of the work suffers the fate of Surgical treatise written by a physician. Another kind of error, that has crept into the texts, is due to transcription. Copies of the texts were made by handwriting; any omission or inclusion, wittingly or unwittingly done by the transcriber, made a great deal of difference in the copies. There is a saying in Sanskrit that the word ;Muhurta; , thrice transcribed, turns into ;Mutra;. Muhurtameans an auspicious moment, while Mutra means urine. This is no exaggeration. In spite of all this, the information that has come down to us is sufficient to enable us to gauge the attainment of the ancient Indians in this respect. Detailed specifications and conditions of contract are the means at the present time to ensure standard and efficiency in construction. The conditions of contract are often harsh on the contractors. Though strict adherence to the specifications can be enforced by law, every man, in charge of constructions, knows how difficult they are to apply without retarding the progress of the work, or without incurring the displeasure of his employer. In ancient days, they seem to have overcome this difficulty, in an ingenious way, by putting the fear of God into an concerned. In medieval times, the quality of workmanship and soundness of construction used to be ensured by imposition of capital punishment or mutilation of limbs; but the ancient Silpis made people believe that nonadherence to the specification or a violation of the tradition would lead one to dire consequences, such as damage or loss to person and property according to the seriousness of the offence; further, to those undaunted by this to be careful, held out the fear of the same consequences to their sons and grandsons as well. The persons, for whom the buildings were constructed, were also not left out; if they did not see that correct procedure was followed, they and their successors also were to meet the ire of the gods. This kind of fear induced in ancient days is a living force; the fear, driven into the mind of the people by centuries of usage, still exists. Sometime ago, a highGovernmentofficial in Simla told me, how the silpis or carpenters engaged by him to make certain additions to his ancestral house in Malabar, consistently refused his instructions notwithstanding the risk of losing his patronage. Why! It was only the other day in the town of Asansol (Bengal), a mason threatened to leave the job rather than place a kitchen door against his traditional practice. The mason could not give any reason for his refusal. Instances, similar to these are many, and they clearly indicate that the Silpi ways are still in the country, though they are submerged and inarticulate. Why should we, in these days of advancement in art. and science, give any heed to what the silpis did thousands of years ago ? Similar questions may be asked about the study of ancient history, anthropology, and classical languages. Whatever contribution has been made by our ancestors towards human progress, cannot but have its influence on our present state and future development. 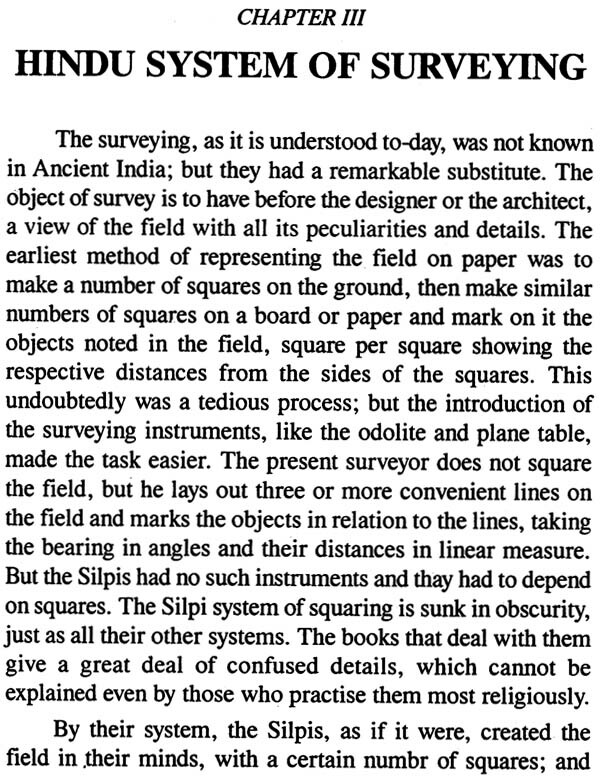 The Silpis appear to have been pioneers in the fields of art and science; their contribution stands high in the fields of mathematics and astronomy; in art and acrhitecture too, though our taste may differ from theirs, they made gigantic strides, and made every attempt to reduce them to sciences. Their attempt to do so is what is proclaimed on every page of the Silpasastas. The study of the Silpasastras or the ways of the Silpis cannot but be of intetest to those who study art and architecture. ;To study a subject properly,; says Sir Thomas Heath, ;we must study it as something that is alive and growing and consider it with reference to its origin andits evolution in the past. 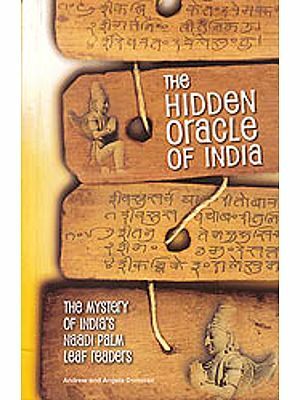 ; A proper study of the Silpi methods, which appear to have had an independent origin, will not only enable us to trace the origin and development of Indian culture in its true perspective, but also confront us with certain ideas and principles, which will be of interest to laymen and experts alike. Further no knowledge of India is complete without knowing the ways of the Silpis.